I live with a wannabe seamstress – seriously every potential project is a sewing project!!! Needless (!!!) to say I am always looking for materials that I have lying around the house!!! And for the longest time I had a couple of extra pillowcases… and she has slowly but surely been whittling away my supply. So I thought a post on Se7en things to do with a pillow case would be in order. One or two of the projects are from projects we have done before but mostly they are fresh off the press!!! We also got some help with a couple of them, we just ran out of sewing steam and these two projects lay on our mending bag for the longest time… When our mending finally got done our friendly seamstress whipped these projects together in about five seconds flat and put our very humble sewing skills into perspective!!! Decorating: A decorated pillow case makes the easiest and quickest gift in the world. Trust me on this!!! Fabric Markers, tie-dyes, whatever… quick, easy and I have never met someone who didn’t like it!!! 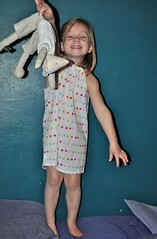 Almost Instant Skirt: Cut the ends off a pillow case. Hem the one end and make a casing at the other end. Thread elastic through the casing and you are done!!! 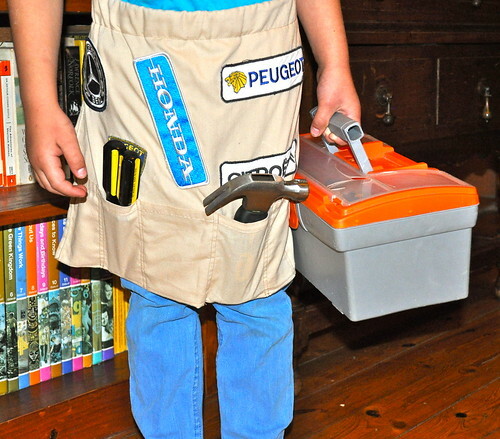 Seriously quick and a great project for people who are learning to drive a sewing machine. The Pillow Case Dress: Lay your pillowcase flat… at the closed end cut two quarter-circles off the corners and cut along the closed seam (the part that would have been the closed end of the pillow case). Hem along your quarter-circles, and make a casing along the two open edges. Thread a ribbon through the front and back casing and tie them or stitch them together. Finally cut the dress to the correct length and hem it. Easy Peasy!!! 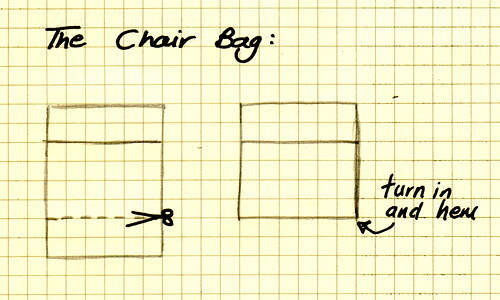 The Chair Bag: Turn your pillow case inside out and slip it over the bag of the chair. Mark a line across the pillow case at the depth that you want the chair bag to be. Turn the raw edges in and stitch the seam closed. Decorate and you are done!!! 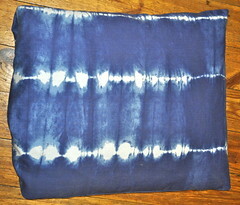 The Laundry Bag: Stitch your pillow turn over flat. Make a casing along the opening of the pillow case, thread some ribbon through the casing and you are done. Seriously!!! The Ballet Roll: I have some little girls who would love to be dancing, for now they are happy to dress up and we have little ballet outfits decorating our house. This helps to keep them, or any other dress-up paraphernalia in one spot. So the open end of the pillow case shut, lay the Pillow Case on its side and open up one of the side seams. Hem along the new opening and then make some Pockets by running seams across the pillow case. Finally stitch some ribbon to the pillow case and you are all ready for action. 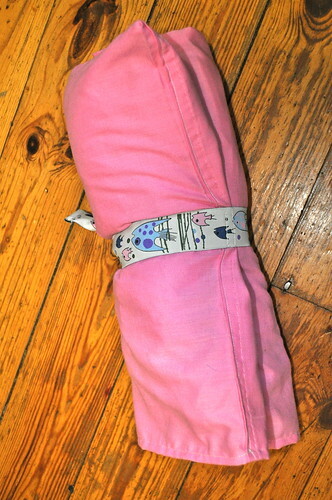 The Tool Belt: Turn the pillow case inside out. Trim the closed end of the pillow case off at the length of the apron you are after. Turn the raw edges in and stitch around the edges of your potential apron. Make a casing along the top of your apron and thread some ribbed ribbon through it. 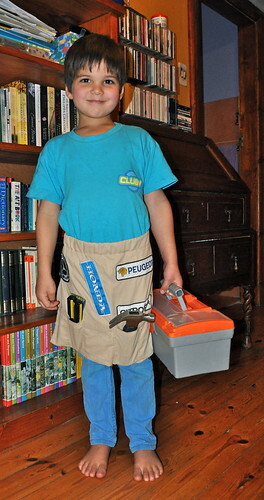 Sew short seams up the fold over of the pillow slip and your tool belt is done. 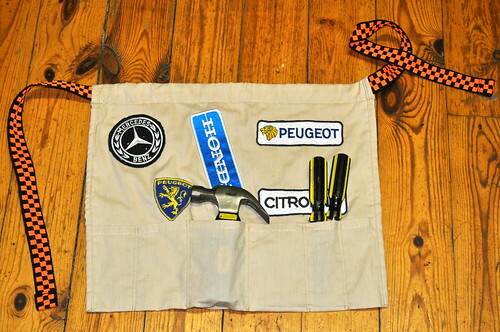 And then if you have a user friendly seamstress she adds some cool badges to the apron and doesn’t that look so cool!!! Replace your tired existing cushion covers for a whole new look: This is really where our post began when the cushions on our couch at the front door started to need some attention… and the sheer volume of people around here means that “some attention” quickly became dire need… Guests were looming, the cushion cover in shreds and I popped the cushions into some stripy pillow cases and had an instant total new look!!! 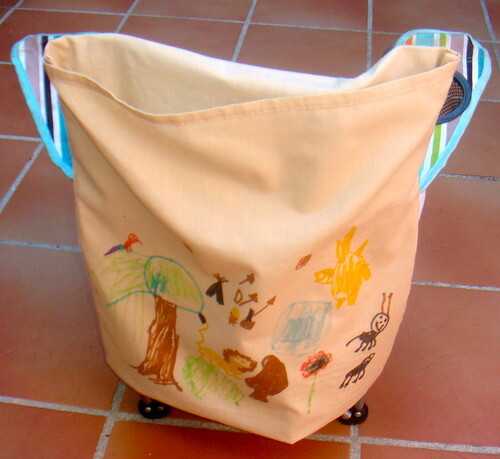 OK , please please tell me where to get fabric markers, i have been looking for a while….. I love the pillowcases – awesome. OK Tammy… You need to have a fairy godmother to send you Crayola fabric markers from the States – I have never seen them here. That being said – I have seen Sharpie permanent markers here in all sorts of colors and I have used them with great success, you just have to make sure that you have thick cardboard behind the fabric you are writing on!!! Hope you guys are having a good weekend!!! Hi! I love most of them, and above all because you have such beautiful “mannequins”!!! BTW, my native language is Spanish (and Catalan, both are official languages in this part of the country) so I guess sometimes I make mistakes, please forgive me!!! Hay KM, How are you doing!!! So nice to have you visit us!!! Glad you liked our pillow cases!!! Hope you are all having a fabulous weekend!!! Hi Lili, Thanks for stopping by!!! You are right about the paints… I love fabric paints – we use them a lot. Thanks for the reminder!!! 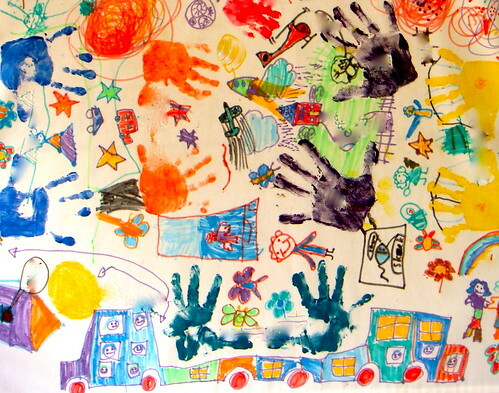 Markers are a great alternative for kids though… I can leave them to it and not worry about the mess!!! I am so glad you stop by and visit our blog. Have a lovely weekend!!! Lots of lovely ideas here. Where do I start? I think the decorated pillowcase is a must. My children would love to do this. Thank you for sharing. Hay Cheryl… Decorated pillowcases are a must!!! Great gift for kids to give their friends… and plain pillow cases are a really cheap buy (well over here at least!!! )… Have a fun week!!! This post is EPIC! you actually managed very well to analyse the sewing steps. Respect! I love your other ideas as well, and, yes, they are all easy-peasy. Hay Seamstress!!!! Thanks so much for helping is with the tool belt, we just ran out of steam!!! Respect right back!!! Love the badges – amazing what folks have lying around!!! Hope you have a brilliant week yourself!!! Lots of love. These are all great ideas!! I love the toolbelt with all the patches! 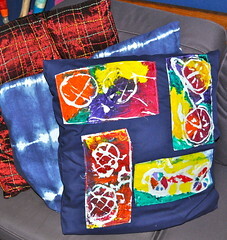 And the simplicity of decorating a pillowcase with fabric markers – I bet that’s SO much fun! Hay Anne, I am so glad you found our pillow case post!!! Thanks so much for linking us!!! I am just thrilled to be on Craft Gossip, Have a great week!!! Hay Maggy, Glad you liked them!!! You have no idea how thrilled I am learning I am learning about the extra hem… my seamstress is going to be back in action and our pillows once again exposed!!! Have a great weekend!!! Glad you liked them Miriam!! !